Rojava, the Kurdish-majority liberated zone in northern Syria, is the location of a unique experiment in grassroots, participatory democracy. It is undergoing a profound social revolution that emphasises social and economic equality, ecology, religious tolerance, ethnic inclusion, collectivity combined with individual freedom and, most obviously, feminism. 30,000 people marched in Vienna on August 31 to demonstrate against inhumane treatment of refugees. In less than a fortnight a series of tragedies took place on the borders of Europe, spurring a continent-wide debate over refugee policy. On August 26, about 200 refugees perished at sea as their ship capsized off the coast of Libya on its way to Italy. A broad campaign by the left-wing Kurdish-led People's Democratic Party (HDP) won a breakthrough 13.12% and denied President Recep Tayyip Erdogan's Justice and Development Party (AKP) a majority in parliament in the June 7 elections. The HDP's success combined with the ongoing example of the progressive Kurdish-led Rojavan revolution across the border in northern Syria has prompted Erdogan's regime to push a strategy of war and conflict against Turkey's long-oppressed Kurdish population. Since Turkish President Recep Tayyip Erdogan's new wave of attacks on North Kurdistan within the Turkish state in the wake of Turkey's June election, people of all ages have joined the effort to defend and govern themselves in the area. Since the 1990s, the Turkish state has used tactics of denial, assimilation and annihilation in the North Kurdistan. Although the promises of peace that the Erdogan's Justice and Development Party (AKP) made when it first came to power awakened hope for many, 13 years later the promises remain unfulfilled. Kurds betrayed: How serious is the US about fighting ISIS? The July 23 deal between the US and Turkey — which gives the US access to Turkey's Incirlik airbase and officially brings Turkey into the US-led “war on ISIS” — makes one thing clear. For Turkish President Recep Tayyip Erdogan and his ruling Justice and Development Party (AKP), the real enemy is not the terrorist group calling itself the Islamic State — more commonly known as the Islamic State of Iraq and Syria (ISIS). It is the Kurdish freedom movement and the Turkish left. Turkish police repress protests against Erdogan's renewed war. The outcome of Turkey’s June 7 parliamentary elections promised so much. Turkey has “joined the war against ISIS”, according to US politicians and the corporate media after a July 23 deal between the US and the Turkish government. The deal gives US war planes and drones access to Turkey's Incirlik airbase from which to conduct air strikes in Syria and Iraq. 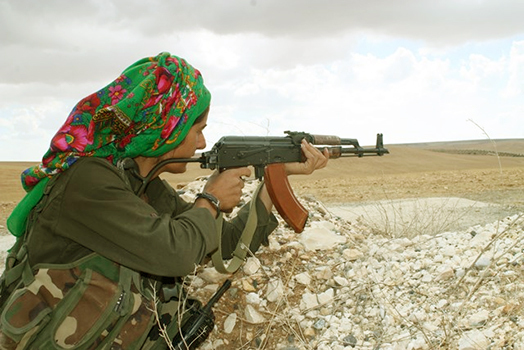 YPJ resistance fighter, Rojava. Picture: The Rojava Report. At a protest outside the Turkish Consulate in Sydney on July 23, Kurdish activists and their supporters accused the Turkish government of complicity in the massacre in Suruc of 32 young socialists on their way to help rebuild Kobane, in the liberated area of Rojava in northern Syria. On July 20, 32 people were killed in a suicide bombing attack on a cultural centre in Suruç, a town in Turkish Kurdistan. More than 100 were injured. Suruç is located across the border from the Syrian Kurdish town of Kobanê, which was besieged by forces of the self-styled Islamic State terrorist group, also known as the Islamic State of Iraq and Syria (ISIS), between September and January.